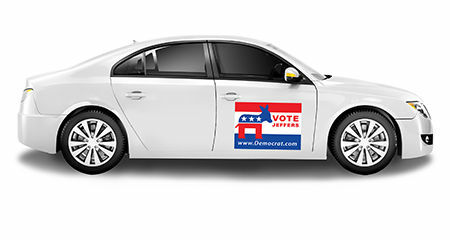 If you are running for office, you can turn your car into a moving billboard without spending a lot of your campaign budget. You can display your name, photo, and the political office that you are running for. The signs can easily be transferred from one vehicle to another. We have lots of political templates that you can customize in our online designer. You can also upload your own artwork file, or work with a graphic designer. Along with our magnetic signs, you can also use our vinyl banners and yard signs to advertise for your campaign.